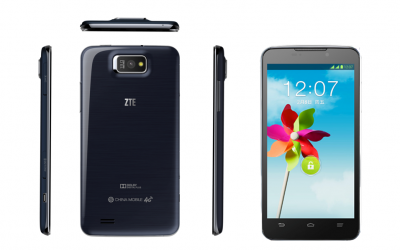 ZTE’s Grand Memo LTE is poised to become the first 4G device available for sale in China, after it became the first to be awarded a TD-LTE handset permit by the Ministry of Industry and Information Technology. The Ministry of Industry and Information Technology issued the first batch of license for 4G mobile network. Samsung, Sony, HUAWEI and ZTE got their first 4G TD-LTE network license and the four TD-LTE handsets are Samsung GT-N7108D, Sony M35T, Huawei D2-6070 and ZTE U9815. As the first LTE Handset available for China 4G network, it has single-SIM, dual stand by voice solution used by ZTE Grand Memo LTE (Model No: U9815), a quad-band device compatible with the TD-LTE/ FDD/TDS/ GSM bands, which means it is capable of supporting simultaneous high-speed data transmission and high-quality voice calls. ZTE Grand Memo LTE is the 4G version of ZTE’s flagship Grand Memo device, offering superior specifications including a 5.7-inch high-definition display with 1280×720 resolution, a 1.5GHz NVidia Tegra3 quad-core processor, 12-core GPU and 13 million pixel camera, supporting 1080P HD video playback and recording. With an ultra-refined display and packing entertainment features including “Home Theater,” the ZTE Grand Memo LTE is well-equipped to take advantage of the fast data transmission speeds of 4G networks. It’s said that the 4G Smartphone could be combines with 3G & WLAN, and it has the functions to transmit video and images in high quality. Regarding the price that users concern, the operator said the price is not higher than the WLAN contract. User could customize the service per the preference. The 4G download speed could reach up to 10 times of 3G link speed, which would let the 4G Smarpthone to watch vedio or transfer documents in large size smoothly; usually it takes only for few seconds.